Food Basics USA started out in 1995 as a Canadian subsidiary to The Great Atlantic and Pacific Tea Company. A&P brought over Food Basics to the United States in 2001 after Metro, Inc. purchased all A&P stores in Canada. Fresh Basics USA originally did not offer fresh meat and deli foods to customers, and some stores did not have fresh produce. 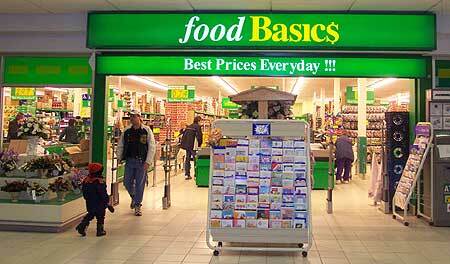 Food Basic stores also did not provide customers with plastic grocery shopping bags, instead offering a small discount per bag each customer brought in or offering a sturdier plastic bag for a fee. Customers were also provided with free cardboard boxes in the case that they did not bring their own plastic bags or did not want to purchase the store’s bags. This policy was not detrimental to the company, and they now provide customers with typical plastic grocery shopping bags. Food Basics is a No-Frills discount supermarket chain. A No-frills service is one that ensures lowest pricing available by reducing all the non-essential features. For example, a no-frills store doesn’t decorate, requires self grocery bagging, and generally only sells generic and private label products. Food Basics USA are smaller A&P stores with just as good quality. They can be found in the Northeast U.S. The Food Emporium Trading Co.